Kevin Hughes’ short film will be shown at the Houston Cinema Arts Festival in Conjunction with the National Aeronautics and Space Administration (NASA) on November 10th. NASA opens its image and sound archives to filmmakers annually to make a short film for CineSpace, a short film competition that is a collaboration between NASA and Houston Cinema Arts Society. Filmmakers are asked to make a short film, of 10 mins or less duration, that contains at least 10% footage from the NASA Archives. Winners are announced and screened along with all finalists at the annual Houston Cinema Arts Festival. Since 2015, CineSpace has awarded over $25,000 in prizes to filmmakers every year. ‘Lift Off’ tells the story of a young girl, Grace who dreams of space travel. She is a fanatical space enthusiast and her bedroom is covered with models and posters of space exploration. One night she is woken up to hear her parents and their friends arguing about the merits of space travel, she is so angry she writes a passionate letter to them about her dreams. They are so moved by her note they stop arguing. Years later Grace is now working for NASA and reads her letter to visitors to the space centre. This inspires a young girl in the audience to follow in her footsteps. Written and directed by Irish filmmaker Kevin Hughes and produced by Damien Donnelly, the short film was made over a single weekend in July of this year. 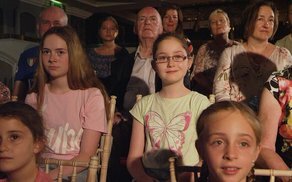 The film stars local Kilkenny talents Jane Brennan, Grace Kennedy, Muireann Ryan, Donie Ryan, Shane Connery, Maddy Joy and Marie Sheehan. The winner of the major international competition is given a top prize of $10,000 for the best film.